When Major League Fishing left Maine, the anglers took memories of exciting, fish-catching action on beautiful natural lakes full of bass. They left sonar data to improve fishing maps for those lakes. 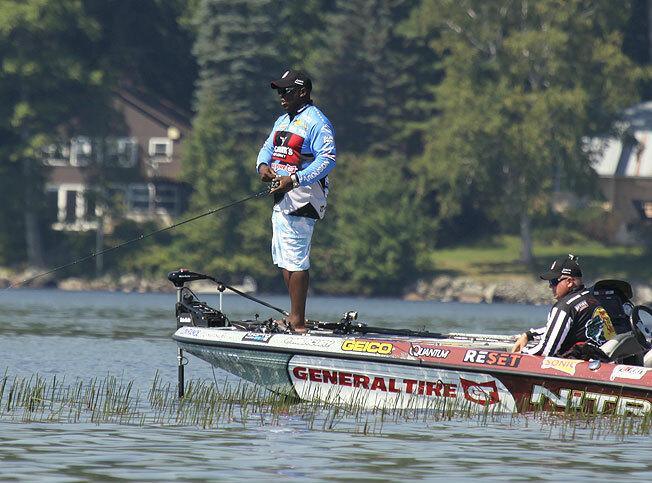 Evers was one of several MLF competitors who recorded sonar logs while competing in Maine in order to update existing Lowrance Insight maps with even greater detail via Insight Genesis. Savvy anglers use Lowrance’s free Insight Genesis service to make custom contour maps of un-mapped bodies of water, improve contour detail on previously mapped waters, and to discover and dissect spot-on-the-spot areas on fish-holding structure. All boats in Major League Fishing competition are outfitted with Lowrance HDS Gen 2 Touch units on the console and bow. Insight and Insight Genesis maps are exclusive to Lowrance, Simrad and B&G chartplotters. The sonar logs that Evers, Monroe and other anglers recorded to SD cards while competing in Maine has since been uploaded to Insight Genesis and aggregated with sonar logs uploaded by local anglers in the Lowrance community to increase the level of detail on existing maps of lakes in the region. The community-sourced map updates were created via – and are available to download for free from – Insight Genesis Social Map. You can sign up for a free Insight Genesis account HERE download unlimited, highly detailed fishing maps for lakes close to home, across the country and around the world – for free.